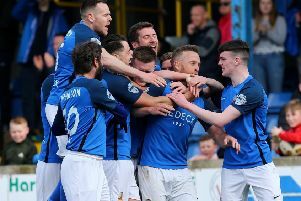 The battle for the Gibson Cup is going to the wire with Linfield edging two points clear of long-time front-runners Crusaders ahead of the final day. The Blues' emphatic win over Coleraine has them in the box seat after the Crues slumped to a 3-0 defeat at Ballymena. Here are some of the best images from another dramatic weekend of action.